Organic materials that mimic the mammalian skeleton muscles are of great interest in artificial actuators for applications such as robot legs, surgical instruments and Braille displays. These ionic polymer metal composite (IPMC) actuators are compact, lightweight, silent, strong and reliable. In this regard, conjugated or conducting polymeric materials are attractive as these offer the desired properties and their actuator operations are similar to biological muscles. This chapter focuses on four types of conjugated polymers: polyaniline, polypyrrole, polythiophene and poly(3,4-ethylenedioxythiophene): polystyrene sulfonate as active materials in IMPC actuators. First, their chemical or electrochemical synthesis is described. Then, their actuators characteristics and performances are discussed and compared. 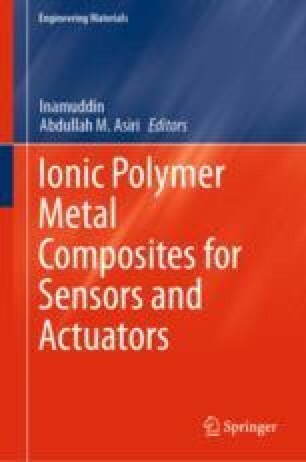 In sum, this chapter aims to give the reader a good overview of the pros and cons in respect of each type of materials as well as their uses in actuators.